Flagging a topic as a favorite will allow you to easily find it later. Flagged topics are listed on the Message Board --> Favorite Topics page. There are several ways you can flag a topic as a favorite. 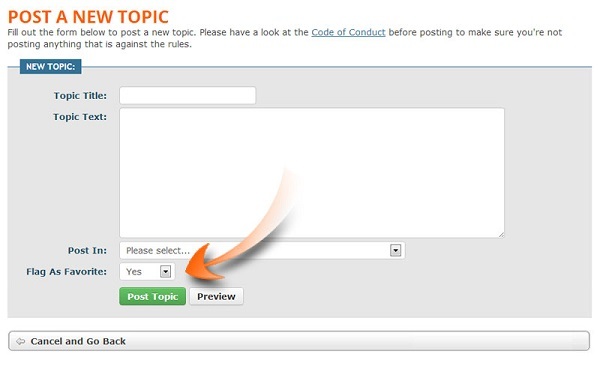 When you create a new topic on the message board it will be flagged as a favorite by default. This will allow you to easily find the topics you've created. You can also choose not to flag your newly created topic by changing the "Flag As Favorite" option to No when creating your topic. Similar to creating a topic, you are given the option to flag a topic as a favorite when you reply. By default this option is set to no so you'll have to change the "Flag As Favorite" option to Yes if you wish to flag a topic you're replying to. As you browse through topics in a message board category you're given the option to flag a topic as a favorite before you open it. This is handy if you know you'll want to flag a topic before you begin reading it. To flag a topic when viewing from a category simply click the grey heart icon and it will turn red. If you've opened a topic and decided you'd like to flag it as a favorite you're given the option on the page. The flagging option for an open topic is located at the top right of each page. To flag the topic click the "Flag Topic as Favorite" button. You can view all your favorite topics by clicking on the Message Board then on Favorite Topics in the sub menu.